We all know that birders travel to northwest Ohio to attend the Biggest Week in American Birding (BWIAB) for the amazing views of warblers and other birds that are possible in that area of the country. What few people think about is the human aspect of this event. In my opinion, this is where the real story lies. Whether it be the connections that can be made with birders from around the country and even the world or the economic effects on the local communities, this event is definitely something special. One of the first things people notice when they arrive at Magee Marsh, other than the awesome birds of course, is the sheer volume of people present at the event. Unless you arrive really early in the morning, which I highly recommend, you will find the parking lot quite full. You will see license plates from all over the country, giving you a feel for how far people are willing to travel to be a part of spring migration at Magee. As you enter the boardwalk, there is usually a pretty good traffic jam at the start because there are always awesome birds to see right from the get go. Many birders that haven't been to Magee before view this as a problem, but I believe it adds to the excitement of the day. Tons of birders ready for a day of birding during the peak of migration is never a bad thing in my opinion. If the birds cooperate, you'll run into many traffic jams along the way and see loads of amazing species. A large group of birders trying to find a Kirtland's Warbler that had been sighted on the boardwalk. The level of experience of birders at Magee is as varied as the states they have traveled from. You are sure to find quite a few people out birding for the first time standing right next to Kenn and Kim Kaufman, Greg Miller, and other birding legends. This to me is another truly fascinating aspect of this event. It really doesn't matter who you are, how good of a birder you are, or where you come from - as long as you enjoy birds, you are welcomed with open arms by everyone. Are you new to birding and just really want to see a Northern Cardinal? Let someone know and they'll point one out for you. Are you a very experienced birder that has a few select target species on your trip? Again, let one of the volunteers or guides know, and they will be sure to advise you of any reports of those birds you're searching for. The theme of birders everywhere continues on into the local restaurants at lunch and dinner. Blackberry Corners is a locally owned restaurant that was one of the first businesses that signed on to the Black Swamp Bird Observatory's Birds & Business Alliance. The decision to support birding and conservation in the region has paid off in a huge way. During the BWIAB, you will find the restaurant packed with birders for both lunch, dinner, and sometimes an afternoon slice of pie! This is true for many restaurants all over northwest Ottawa and Lucas Counties. Check out the list of all the companies that have chosen to support BSBO and conservation here. Look for this sticker at local businesses to see who is supporting birding and conservation in northwest Ohio. Of all the great things about the BWIAB, I believe the greatest is the effect the festival (and all birding in the region for that matter) has on the local economy. It cannot be stressed enough that northwest Ohio feels the impact of all birders that travel to the area. In a study that was recently conducted by Bowling Green State University, it was found that birding contributes as much as $26 million and 283 jobs to Ohio's Lake Erie coast. This is a significant impact on the local economy, especially when you consider that much of this money is spent during spring migration, a time when the duck hunters have left the region and the peak of the fishing and beach season has not yet arrived. We are filling a critical gap in tourism that would otherwise threaten to make the local businesses shut down during the downtime. For all of us that live out of state and have been traveling to northwest Ohio for years, it seems relatively obvious that we are spending a lot of money on our travels. But now we actually have the numbers to back it up. One of my favorite moments of my time at the festival this year occurred at the gas station while I was filling up my car. A local man struck up a conversation and asked what I was doing in Ohio when he noticed my Indiana license plate. I explained that I was there to lead trips for the BWIAB. Much to my surprise, he thanked me for being there to help support the effort to bring more people to northwest Ohio. He personally wasn't interested in going out and looking for birds but was supportive of all of us who were and understood the impact that we are making. I was absolutely blown away by this conversation. The residents of northwest Ohio are recognizing what we are doing. This makes them more likely to support the conservation initiatives that are critical to keeping the birds flowing through the region. I am already looking forward to being back in northwest Ohio next year for the BWIAB and hope to see many old friends and new birders alike. 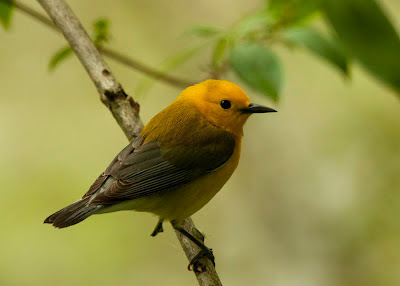 I will leave you with one of the most photogenic birds on the boardwalk, Prothonotary Warbler. Rob, I'm really not much into crowds but your post is inticing me to make a future visit to the Biggest Week in American Birding. Mia, you should go. It's a festival, and the atmosphere is that of a festival. It's lots of fun, and the crowds are not a problem. Mia, you definitely need to make it up to the Biggest Week! You would love the photo ops along the boardwalk. Beautiful photo of this bird. You're as talented at writing about birds as you are at guiding people to see them! Thanks so much for being a part of our team, Rob. We are truly honored. Thank you Kim! To be considered part of this great festival is a true honor! I couldn't agree more with your article Rob. The Biggest Week is a birding festival after all, and I loved the festival atmosphere. Wonderful birds; wonderful birders. What more could anyone want? I enjoyed meeting you, and I hope to see you again next year! Thanks Linda! It was great to meet you as well. I will definitely be there next year! It looks like such a great time, and a very important tradition for the sustenance of North American birding. Thanks for posting and keeping the warm feelings flowing, even for those of us who couldn't be there. Thanks Laurence! Hopefully you will have the chance to attend sometime. Wonderful post! I can feel the excitement of the event through your wonderful writing. Though I am not much of a crowd person, I might choose to attend this festival in the coming years. I have read so many wonderful blogs about The Biggest Week in American Birding. You should definitely come to the festival as soon as you can! The crowds of birders are really a ton of fun and the birds are everywhere.